I read over at TechCrunch about a new Lifestreaming service called Iminta that just went into private beta. This one was started by some former Cnet’er. Leaving high profile dotcoms to start Lifestreaming services may be a new trend. If you remember it was a group of former Googlers that started FriendFeed as well. 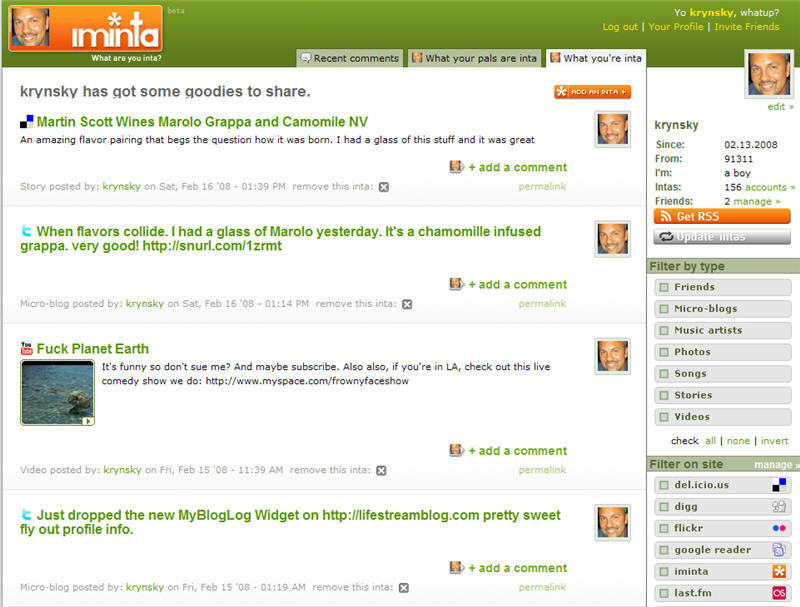 Iminta first appears like any other Web 2.0 obscure domain name, when in fact it’s slang for “I’m Into”. That toungue in cheek attitude makes way to other areas into the site where they use the “inta” verb as a title for other areas of the site. I was able to get an invite and have played with the service a little. My initial impression is that this is a worthy entrant into the ever growing Lifestreaming service forest. Setup was very quick and simple, the site has a very nice layout, and they have defitely put a lot of time into looking at the Lifestreaming space and providing very useful features to place them near the top of the list. I’ll play around some more and hopefully have a full review up soon. In the meantime you can check out a screencast that demonstrates Iminta, along with several other stories on the web about Iminta below and if you are interested in an invite leave a comment below as I may have a few to hand out. I will interested in checking out. Please send me INVITATION. Once I check it out I can come back and share my experience about the same. Never really occurred to me to leave a comment on the designboom weblog.. i mean sure, i read you guys everyday, but the posts i find interesting i fave or bookmark or share the url to others, rather than clicking the comment link. It's good to know your stand towards this comment thing going on. I've visited some design sites before that I find have repetitive comments from visitors, might be one of those you were pertaining to.